When your business switches to a content management system, it's often viewed as a solution in a box. But if you're working with a CMS on a daily basis, you're likely to see through that promise. Most CMS systems come with their own set of limitations. But how limited are we, really, when it comes to using them? Mark Gowland, EVP, Executive Creative Technology Director, at Deutsch, recently wrote an article for Venture Beat suggesting these limitations are so severe that they're killing innovation. And we're inclined to agree with him. Here's why. As Gowland mentions, many of the CMS options available on the market are clunky to use, much to the dismay of clients that may want a bit more flexibility when it comes to the look and feel of their website. When you're adding a CMS to a website, installation is just the first step. You'll have to tweak to meet a client's needs. It's hard to get the end product that your client wants and when you're retrofitting the CMS to an already completed website, the fit isn't seamless. It's like adding a pop-out addition to a house. The CMS will work, and function, but it takes a lot of work to make it appear seamless or natural within the framework of the website. Gowland also points out that on top of these inconveniences, when it's time to finish the work for your client, there's always an issue with training. Clients want and expect the CMS to function as a turnkey solution that they can handle from here on out. Unfortunately, it doesn't work that way. Any changes aside from straight article content—such as adding images or trying to change the layout—can become a source of constant frustration. When you're working with a CMS, this challenge is always ripe, and many clients won't have a person with the technical expertise on staff to help them make any adjustments. Let's face it, with many CMS platforms, there's little room for creativity when you don't know the platform inside out. When it comes time to hand a project over to a client, expectations can quickly lead to frustration when it's time to train them on the basics. Most of the CMS platforms aren't exactly intuitive, and they're difficult to work with if you want to do anything beyond uploading a text article. You choose a custom build to meet the needs of your clients, and the truth is, in many cases, it makes more sense to build from scratch than tinker with a CMS platform to adapt old technology to new. Sometimes, when it comes to getting the most out of a system, it's best to build a powerful one with the right capabilities that can help a website look better and function more efficiently. Even when you are adding new technology to the mix of features. 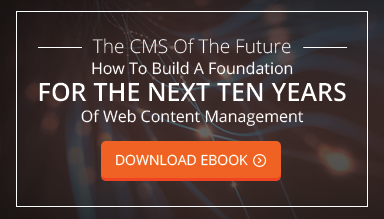 And the best part is that custom solutions can actually deploy more quickly in many cases than an out-of-the-box CMS because they're built to support the capabilities of a website. Custom solutions are a great way to help drive innovation and creativity, and you won't have to wait for the next patch to come out to deploy new features. While many small businesses and marketers will still find a use for a traditional CMS, the truth is that they are just one solution that's bundled to fit a customer's needs. If those needs expand, a custom solution is another tool that you can reach for to help power your business. You don't have to let the limitations of an out-of-the-box CMS hold you back from being as creative as you want to be.